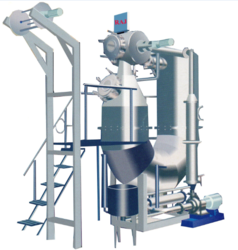 Pioneers in the industry, we offer beaker dyeing machine, horizontal yarn dyeing machine, vertical yarn dyeing machine, economical multi nozzle soft flow dyeing machine, soft flow dyeing machine and beam dyeing machine from India. 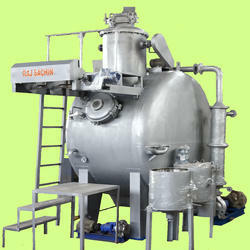 WE provide our clients a high-quality Glycerine bath Beaker Dyeing Machine (HTHP Beaker dyeing machine). Owing to its various features like even dying, this dying machine is widely praised in the market. We offer this dying machine to our customers in different sizes and designs so as to meet their needs. 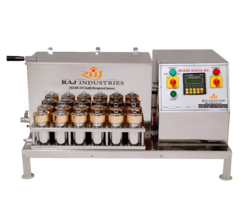 RAJ INDUSRIES HTHP Vertical Yarn Dyeing Machine has been designed for dyeing Polyester, Cotton, Viscose, Nylon, Acrylic, Texturised, Silk, etc., in various forms i.e. Cones, Loose Hank, Tops, and Fabric etc. It caters to the needs of high productivity textile Industries. Precision engineered High Temperature High Pressure Verti-cal Yarn Dyeing Machine has become the first choice of dyeing plant throughout the Textile Dyeing Industry. 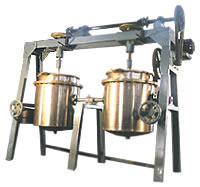 The Dyeing machine is fitted with reversible pump which circulates liquor in both directions i.e. INSIDE - OUT & OUT-SIDE - IN. Our constant research & development has resulted in saving of Dyes & Chemical, Thermal Energy and Water with mini-mum MLR (Material to Liquor Ratio) depending on the nature of yarn and loading factor. 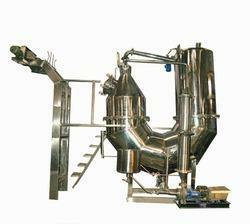 The machines are offered for capacity up to 500 kg / batch. - Machine body and all parts coming into contact with the dye liquor are made of AISI SS 316Ti/316L, highly corrosion resistant. - Double Stage Turbo Pump for liquor circulation with Inverter Drive for varying speed. - Ultra Low MLR of 15 (Fully Flooded). 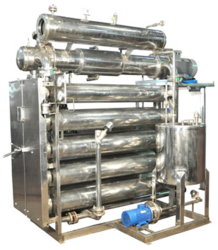 - Air pad System to insert air manually into the machine to create static pressure and to minimize the liquor ratio. 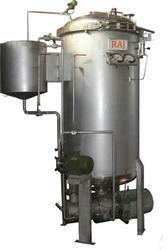 - Color addition tank with Injection Pump for dozing the dye liquor into the machine. 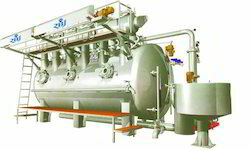 - High Efficient Heat Exchanger which has no heat loss to the ambient. - Variable loading with flexible loading spindles or capacity reducing Dummies. - HT drains - the machine can be drained at 130 Degree C.
• Suitable for nearly all types of fabric quality. • High Temp. - Up to 140°C. • Max. Fabric Speed - 400 Mtr./Min. of all types of fabric quality. • Number of very soft nozzles. • Fully automatic with PLC. This Machine is Specially Design to process Heavy and sensitive fabrics like Terry Towel, Curtain Bed sheet of 100% Cotton knit and woven fabrics. Machine able to work as a soft / Over flow with minor adjustment. Larger nozzle diameter, Higher volume low presser nozzle design and inside Teflon sheet is help to move the fabric very smoothly and gently without damage the fabric. 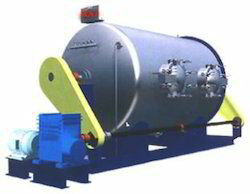 - Capacity 25 to 2000Kg. - Process have & sensitive fabric like Terry Towel, Curtain, Bed Sheet, 100% cotton knit & woven etc. - Work as a soft flow as well as over flow dyeing. - High Temp. - Up to 140 DegreeC. - Specially design filter to collect towel fumes. - Teflon Sheet inside the chamber for smooth fabric movement. - High volume, Low pressure soft nozzle with larger diameter for heavy and larger width fabrics. - Fabric drive reel with frequency controller. - Fully automatic with PLC. - Pre-heating tank with accessories. - Magnetic level indicator / controller. H.T.H.P. Economical Beam dyeing machine is the proved technology worldwide to bleaching and dyeing Woven & Knit fabrics in open width. Our Economical dyeing machine is equipped with our energy saver "RAJ INDUSTRIES" which alimented the dyes and color injection pump and reduce stem, water and electricity consumption. • Capacity: 100 to 200Kgs. • Process Woven &Knitted fabrics in open width. • Beam: Dia 300mm x 1800mm Long. 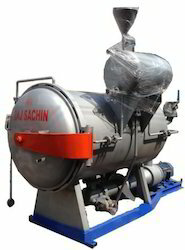 • Duel head design, Multi flow, high pressure centrifugal pump for dye-liquor in & out circulation. In this development, there is no fabric drive reel to move the fabric. The Fabric movement by only force of water. It is economical, because of low liquor ratio it's reduce every think. It is user friendly because comparison with long tube dyeing machine, to control the fabric movement 4 valves equired. Here in this Jet dyeing machine and Fabric Dyeing Machine there is Only one valve. Absent of reel, reduce connecting electric rim power, maintenance of two mechanical seal and breakdown time, if Jet pressure and reel speed not synchronized. Nearly without fabric drive reel machines are saving energy and reducing pollution in 23 countries of this planet. - No fabric drive reel. - Fabric Speed - 300 Mtr./Min. - Magnetic level indicator/ controller. 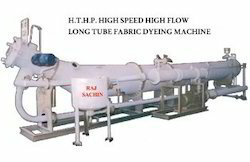 Economical Top Tube Soft flow dyeing machine very much suitable to process sanative woven & knitted fabrics. It's very soft nozzle decrease the tension and avoid the problems like crease marks, rope marks, shrinking etc.. Another drawback of this machine is its single vessel two chamber design. Its reduce the fabric loop length as well as process time. - Capacity 100 to 350Kg. - Single Vessel 2 Chambers to Reduce loop length. - Liquor ratio 18 (Wet fabric) - High Temp. - Up to 140 DegreeC. - Double tube for higher capacity. Vastly Improved Smoother Running Condition: Dyeing of micro-fibers at liquor ratio 1:8 in fully floating condition. Running At Stable, Lower tension: No more clogging up in the back of the chamber at room temperature to get better result of bio-finish as well as suitings and shirtings. Our latest design, which requires a slope on the rear construction gives an improved smother fabric transportation and stable loading condition to gext tangle free operation during the low and high temperature process. Low Liquor Ratio Dyeing: More uniform circulation and better liquid separating contributes to stable and lowertension running while process. • Specially design bow jet nozzle for extra force. • Fabric drive reel with frequency controller. • Pre-heating tank with accessories. • Magnetic level indicator / controller. • Double tube for higher capacity. This Machine is suitable for dyeing as well as weight reduction for synthetic fabric. Fabric are circulated with low tension by alkali liquid sprayed from soft nozzle which give good feet result and improves the evenness of the fabric. the machine is capable for interactions of the fabric with sodium hydroxide (mercerization) for any type of fabric like Cotton, Tencel, Manmade fibers, Newcell etc. 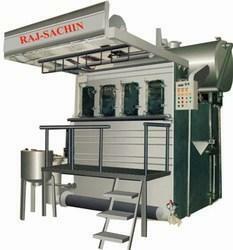 We offer a wide range of Rotary Drum Washer as per client require.This H.T.H.P. rotary drum washer machine,rotary drum washer,rotary drum machine, relax rotary drum washer which are especially developed shrinking process for bulkiness and gooji effect on synthetics fabric. • Fabric moving with out bag / with bag. • Separate doors for loading unloading with require safety devices. • Feeding tank,Quick draining system to save time. • Magnetic level indicator / controller,Indirect heating system. Specially design online filter design helps to collect the Terry towel fumes. • Capacity : 25 to 2000Kg. • Process have & sensitive fabric like Terry Towel, Curtain, Bed Sheet, 100% cotton knit & woven etc. • Work as a soft flow as well as over flow dyeing. • Specially design filter to collect towel fumes. • Teflon Sheet inside the chamber for smooth fabric movement. • High volume, Low pressure soft nozzle with larger diameter for heavy and larger width fabrics. Cooking Pan offered comes in quality finish which helps make cooking safer and healthier.